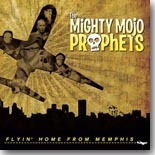 The Mighty Mojo Prophets first received notice with their BMA-nominated self-titled debut release in 2011. The group is different from many bands just getting a start in that they focus on all original songs, rather than rehashing previously charted territory. Tom �Big Son� Eliff and Mitch �Da Switch� Dow are responsible for the songwriting, and are equally impressive as a singer and guitarist, respectively. The rhythm section of Alex Schwartz (drums) and Dave Deforest (bass) completes the quartet. Their sophomore release, on Delta Groove Music, is called Flyin� Home From Memphis. The Prophets play the blues straight-forward and honest, with respect toward those blues legends who preceded them, but also with a fresh approach to the traditional style. The opener, �Sweetness,� is an old-school swinging blues track with San Pedro Slim adding harmonica to the mix, while �The Gambler� starts out with a funky backdrop and signs off with that familiar Magic Sam guitar riff. The R&B-flavored �I Can�t Believe� adds swirling keyboards from Mike Malone and the B7 Horns (Mark Sample � tenor sax and Johnny V � trumpet). Other standouts include �The .45,� which showcases Dow�s slide guitar and harmonica from Alex �Li�l A� Woodson, �California,� an excellent jump blues that covers their trip to the Bluff City, �Remember Me,� a simmering slow blues track with more great harp work from Woodson and another sensational turn by Dow on slide, and �Jo�s Jive,� a jazzy instrumental. �One For Me� and �Strong Medicine� veer toward 50�s-era rock n� roll (the former) and vintage Bo Diddley-styled R&B (the latter), and �She�s Gone� is a country blues number. Flyin� Home From Memphis is a rock-solid set of traditional-style West Coast blues with healthy doses of Chicago, Texas, and the Mississippi Delta thrown in for good measure. 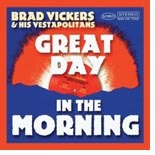 With their latest release, Great Day In The Morning (ManHatTone), Brad Vickers & His Vestapolitans offer up 15 tracks of �feel-good� blues. A Vestapolitan recording is always a barrel of fun because Vickers and company clearly love playing their blend of roots music that mixes blues, Americana, rag time, and even rock n� roll. This time around, Vickers and Margey Peters combined to write 11 of the 14 tracks. The focus this time around is more on the old timey brand of roots music, but with a modern flair. For example, on �This Might Not Be Your Day,� backed by fiddles, mandolin, and baritone saxophone, Peters sings of ATM machines, expired driver�s licenses, and broken iPods. The occasionally �modernized� lyrics are pretty cool against the musical backdrop. Vickers gets plenty of opportunity to show off his bottleneck guitar skills on tracks like �Train Goin� Westward Bound� and the boisterous title track, as well as a great cover of the Tampa Red tune, �Anna Lou Blues� (a predecessor of the classic, �Anna Lee.� The band also covers Memphis Minnie�s �Frisco Town,� and their 2012 digital release, �Dallas Blues,� is included as well, with proceeds still going toward The Blues Foundation�s H.A.R.T. Fund. Several tracks include the fiddle of Charles Burnham, who teams us with Peters (who also plays fiddle and bass) to really give the music an authentic feel. V. D. King also adds banjolele on several tracks, notably �Chapter and Verse� and �Saving String Rag.� Other contributing musicians include producer Dave Gross (mandolin, upright bass, percussion), Jim Davis (tenor saxophone), Matt Cowan (baritone saxophone), Michael Bram (mandolin), Bill Rankin (drums). A pair of tunes, �The Way It�s Got To Be� and the gospel-flavored �Together For Good,� also feature vocal contributions from Christine Santelli and Gina Sicilia, with the pair sharing lead vocals with Peters on the latter track. Great Day In The Morning is another fine addition to the Vestapolitan catalog. It�s sure to put a smile on your face and a hop in your step. The Mike Eldred Trio�s latest release, Elvis Unleaded (Rip Cat Records), is a rocking tribute to Elvis Presley that finds Eldred and company ripping through 20 tunes associated with the King via his recordings and movies. Eldred and band (Blasters bass player John Bazz and drummer Jerry Angel) are one of the finest roots bands currently playing and this music is right up their alley. On selected tunes, they get assistance from Gene Taylor (piano), Jerry Donato (tenor sax), Scott Yandell (trumpet), and the JOBS Quartet (backing vocals). The tunes are mostly rock n� rollers that most Elvis fans will be familiar with (�Burning Love,� �Rip It Up,� Bossa Nova Baby,� �Little Egypt,� �Girls, Girls, Girls,� �Jailhouse Rock,� �Heartbreak Hotel,� �T-R-O-U-B-L-E,� etc�..), but there are also a few R&B numbers formerly recorded by others that Elvis adopted for his own (Lloyd Price�s �Lawdy Miss Clawdy,� Little Richard�s �Long Tall Sally,� The Spiders� �Witchcraft,� and Smiley Lewis� �One Night Of Sin�). Of course, straight blues is present, too, as is usually was in anything that Elvis did (�I Feel So Bad� and �Big Boss Man�). Eldred and company do a wonderful job interpreting these tunes. They don�t try to imitate Elvis so much as they breathe new (or renewed) life into the songs, which is cool because some of these songs traditionally don�t receive as much attention among Elvis fans as they deserve. Eldred also gets plenty of space to play some great guitar in the Scotty Moore tradition. 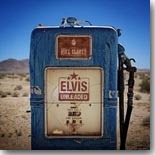 Elvis Unleaded is must-listening for fans of the King, as well as for fans of blues and roots rock. The Mike Eldred Trio remains one of the top blues and roots ensembles and this disc should help them welcome many more fans on board. Last year, Andy Poxon�s debut release, Red Roots, was issued to positive reviews. The then-16-year-old impressed all with his impressive guitar chops, surprisingly mature songwriting, and his versatiility, moving easily from blues to R&B to country, swing, and jazz. The now-18-year-old�s follow-up, also on EllerSoul Records, is called Tomorrow, and proves that the youngster�s debut release was no fluke. This time around, there are a few positive additions --- Duke Robillard is on board as producer and also adds his own first-rate guitar work in support. Also working with Poxon are several of Robillard�s regular band � Brad Hallen (bass), Bruce Bears (keyboards), Mark Teixeira (drums), Rich Lataille (tenor and alto sax), Doug Woolverton (trumpet), Mark Earley (baritone and tenor sax), along with steel guitarist Frankie Blandino. One thing I have enjoyed about Poxon�s music is that he doesn�t try to write beyond his life�s experiences. Let�s face it�.it would be hard for an 18-year-old to pass off lots of older blues standards. Wisely, Poxon relates the blues from a younger man�s viewpoint. Take �College Boy,� for example. Poxon laments losing his girl to an older guy. The rest of the 13 tracks penned by the young man take the same approach�.never overreaching their bounds, and he proves himself to be an excellent composer with the promise of getting even better as he lives life. Vocally, he has a smooth, easygoing, yet vulnerable style that works well in the various styles that he offers up on Tomorrow, but his jaw-dropping guitar work is the real heart of the disc. He moves seamlessly between urban blues, rockabilly, R&B, soul, swing, rock n� roll, and even country. The closing track, an instrumental composed by Poxon and Robillard, is a smooth instrumental guitar double header that will put jazz fans in mind of Wes Montgomery, Kenny Burrell, and George Benson. As you listen to Tomorrow, please keep in mind that Andy Poxon is only 18 years old. When I was 18, I could barely play a radio. If the young man is this good now, just imagine what the years ahead will bring from him. I don�t know for sure, but it�s sure a lot of fun to think about. In the liner notes to Out Of My Mind (Yellow Dog Records), the latest release from Cassie Taylor, the dedication reads, �Dedicated to my man, who sold his car to make the album.� Based on the results, Taylor�s husband made one of the soundest investments ever. Her new release takes what Taylor offered on her excellent 2011 debut, Blue, a fresh new slant on the blues, and cranks things up a notch. As on her previous effort, Taylor, the daughter of blues man Otis Taylor, wrote all of the songs, and they are all great, including the impressive two-part opener, �Ol� Mama Dean,� a smoldering tale of abuse and revenge. �Spare Some Love� is a moody minor-key blues tale of poverty with some sweet guitar work from Steve Mignano, whose fretwork is as huge a part of this recording as Taylor�s powerful vocals. The buoyant pop-styled title track is another standout. �Lay Your Head On My Pillow� is a lovely tune written for her parents� 23rd anniversary, and �New Orleans� is a tribute to the Crescent City. �Forgiveness� is an unusual tune with trumpet and tuba accompaniment that travels the same funky path.�No Ring Blues� was written for her then-boyfriend (now husband, who sold the car), who finally did take the hint, and �That�s My Man� is a fine blues rocker. The somber �Again,� with Taylor on piano, closes the disc. Taylor plays bass, piano, Hammond S6 organ, and theremin, and is backed by Mignano, Larry Thompson (drums), Steven Vidaic (Hammond organ), Jon Gray (trumpet), Todd Edmunds (tuba), and Owen Tharp (bowed bass). She also produced the disc and it has a warm and earthy feel to it. 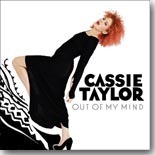 Out Of My Mind shows Cassie Taylor, only 26, to be at the top of her game as a singer and songwriter. Jason Elmore would appear to be the total package�..a first-rate guitarist, singer, and songwriter. The Dallas-based musician performs as a solo acoustic act and also fronts a stellar blues/rock trio, Hoodoo Witch. The trio is not just adept at blues/rock, but also seamlessly blend country, jump blues, and soul/R&B with their brand of blues. Their latest release, Tell You What! (Underworld Records), is a shining example of that brand. This is an amazingly diverse release, with Elmore moving from country flavored rock (Buck Owens� � Buckaroo,� and his own �When The Sun Goes Down�) to blues/rock (�Southbound,� ��Bottom Feeder,� Rory Gallagher�s �Country Mile�) to a modernized look at traditional blues (the Freddie King instrumental tribute, �Sharecropper�s Shuffle,� the swinging �Good Foot,� and �She Fine�) to some smooth R&B/soul (�Cold Lonely Dawn,� Sean Costello�s �Don�t Pass Me By,� and a marvelous cover of William Bell�s �You Don�t Miss Your Water,� which features a soulful vocal from Elmore and some dynamic lap steel work from Kirby Kelley. Sometimes, albums like this, trying to span a variety of genres, tend to overreach, but Elmore and band (Chris Waw � bass, Mike Talbot � drums�.with guests Kelley � lap steel, Jim Suhler � slide guitar, Ron Jones � horns, and Tommy Young � B3 organ) sound great whatever they�re playing. Tell You What is an excellent release�.just a perfect mix of blues, rock, R&B, soul, country, and even jazz thrown in for good measure. 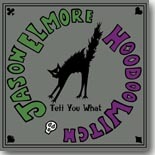 I guarantee that it will leave you wanting to hear more from Jason Elmore. 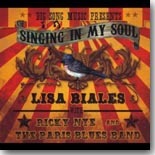 Lisa Biales� latest effort, Singing In My Soul (Big Song Music), teams the Ohio-based vocalist with Cincinnati piano man Ricky Nye and the Paris Blues Band (Thibaut Chopin � upright bass, Anthony Stelmaszack � guitar, Simon �Shuffle� Boyer � drums) on a diverse set of ten songs. Nine of the tunes are classics encompassing gospel, blues, old time pop, and even vintage rock n� roll, plus one original tune by Biales. Also assisting Biales on the recording are Bill Littleford (guitar), Chris Douglas (upright bass), and Brad Meinerding (mandolin). It�s amazing that a singer as gifted as Lisa Biales isn�t more widely regarded. Hopefully, Singing In My Soul will help her find the larger audience she deserves. Ron Dziubla is best known for his tenor and baritone sax work behind legendary guitarist Duane Eddy, but he�s also released three albums of his own, including his most recent work for Rip Cat Records, Nasty Habit. Recorded at the Pow Wow Fun Room recording studio in L.A., Dziubla employed guitarist R.J. Ronquillo, bassist Sam Bolle, and Los Straitjackets drummer Pete Curry (who also co-produced with Dziubla), with former Blasters guitarist James Inveld guesting on a few tracks. Dziubla rips through 11 rocking tracks (nine originals) that mix blues with vintage R&B, rock n� roll, and even surf music. Tracks like �Moan,� the zany �Spy Time,� �Shaken and Stirred,� and �Slapped� rock really hard, while tunes like �Loose� and the wild title track take you back to those vaunted days of surf music, while other tunes like �Fine Time,� �Bordello,� and �Lemon Drop Martini� have that �cool� sax sound so popular back in the �50s. If you dig those great old recordings that featured sax men like Curtis, Forrest, Big Jay McNeely, Red Prisock, Lee Allen, Joe Houston, etc�., then you have reached nirvana with Nasty Habit, a rocking sax fest from start to finish. 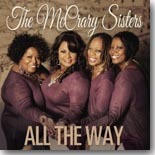 The McCrary Sisters are a Nashville-based vocal group, consisting of sisters Ann, Debra, Regina and Alfreda, strongly influenced by gospel and soul music. Their new self-released CD, All The Way, shows all of their various influences coming together on a dozen numbers, all but three of which are original compositions. For my tastes, the album really starts to cook midway through, although there's nary a weak number here. My favorite cut is the next to last one on the disc, when the Sisters take on a slow blues, "Talk To You." Regina co-wrote this one, so I assume it's her on lead vocals, with guitarist Rob McNeilly and pianist Kevin McKendree contributing stellar instrumental work. "Hum And Moan" is haunting, backwoods gospel at its best, with special guest Colin Linden accompanying on slide guitar, bass and dobro. Linden also co-wrote the song along with Regina. Following that dark number is the uplifting "Right Where You Are," with McNeilly back on slide guitar and McKendree again giving the song its gospel vibe with both his excellent piano and organ accompaniment. A pounding drum beat leads into the uptempo gospel-tinged "Train," featuring an ensemble consisting of 16 different accompanying musicians on instruments as diverse as cello, viola and clavinet. There's a lot of sound coming out on this tune, rivaled by the amount of emotion the Sisters pack into it. Following is the much more stark "Skin Deep," a Buddy Guy original that includes brother Allen McCrary contributing very nice understated accompanying vocals. The McCrary Sisters aren't new to the music business but may not be familiar to the mainstream blues audience. If you don't know about them, All The Way is a good introduction to this exciting and musically diverse group.